This picture was taken a few years ago when Ann and I celebrated our anniversary in Vail, Colorado. Today we celebrate number 16 and our love and commitment to each other could not be stronger. As Ann's hair falls out this week from her chemo treatment I am reminded of the inner beauty that I was drawn to so many years ago. 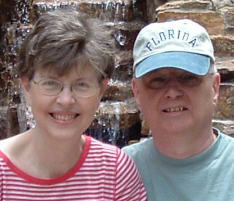 Call me blessed, or the luckiest man alive, but I cannot believe the many ways that God has enriched my life with Ann. Well Congratulations on your Sweet 16, and btw you both look happy too. Bob...we are blessed to have the partners we have. Happy Sweet 16! May God bless you with many more. Happy Anniversary, Bob and Ann! May you savor every moment of this special day. Happy 16th anniversary and many more. That's terrific, and I hope you have many more. Thanks so much for the wonderful wishes. Ann and I had a great day! And congratulations from me too!